Over the course of the past few weeks I took the Western Civilization I and Western Civilization II CLEP tests, to (fast track the pace!) rack up some credits towards my history degree. (When you are a mom you don't have all the time in the world to attend class after class towards a degree. In fact, I have to say, if you are a college student and you have no children and you are not married, you have nothing to complain about.) CLEP tests are wonderful things! I've talked before about my passion for history and why I think it is still relevant to today. As I said before, history is not dead because we are still repeating it. We will go on repeating it so long as we are living because human nature is to say, "I am the most important person in the world. Nothing has mattered before me and nothing will matter after me. I am all." (I know that this is the human tendency because I suffer from such delusions of grandeur myself.) Really though, while I do matter, I am not All That Ever Was and Ever Will Be (I assume) and so there is some merit and value in finding out what other people(s) are like, were like, and what they have done. You know the old adage about learning from other people's mistakes instead of your own? If you crack open a history book, you might avoid a few problems which other people have already processed through. Now, the thing about the CLEP is that you are supposed to "lightly study everything" which is next to impossible for me. I have to start at the beginning and work my way to the end so I did purchase an actual textbook. However, two weeks is a very short period of time to cram your head full of facts from "The Stone Age" to the 21st century (all 1,105 pages!). I don't know how anyone can be expected to know ALL of that for two tests when clearly the book was compiled by four people who no doubt hired people out as researchers. Nevertheless, I boldly ploughed through it. Mostly. Again, I had a hard time reading modern history because it still feels so very relevant and therefore makes me feel disheartened when I don't wish to be. I can only tell you about this particular textbook from the stone age through World War I (being a fan of WW2, I made a flimsy wish and a hardy prayer that I could swing the WW2 questions and still pass - and I did, whew!). Now, because history is dry to most people I shall do my best to be entertaining. Witty. Knowledgeable. Yet appealing to the masses so as to avoid revolt. That in the mid 1700's the potato was introduced to the world. The potato, small and dirty little thing you might think that it is, was heralded as the savior of the world at the time. It saved many a people from starvation because it's a prolific little bugger (pretty much). One can never have too many potatoes, don'tcha know? It had but one complaint upon introduction to society. "What is a little wind to the vigorous organs of the peasants and workers?" The Encyclopedia was created during the Enlightenment period by a man name Diderot. The Encyclopedia sought to "change the general way of thinking." The point of this series of books, published in installments between 1751 and 1772, was to demonstrate how the everyday applications of science could promote progress and alleviate all forms of human misery. The volumes sold quite well, despite the ban. THE Napoleon's (not Dynamite) most "significant accomplishment" was the completion of legal reforms. Napoleon personally worked on the portion of The Napoleonic Code that dealt with the family. Napoleon seemed to be a little wary of women in general, reinstating the "natural supremacy" of the husband. While I do agree that the man should be the spiritual authority and clear leader of the home, Napoleon thought about men in more political terms than spiritual ones. Under the Napoleonic Code fathers had all the authority for everything. Fathers could even have their children imprisoned for up to six months time without showing a cause for it! Why, if you are anyone at all, you might not like this book: It is very biased in an anti-religious sort of way. When I say "religious" I mean religious. 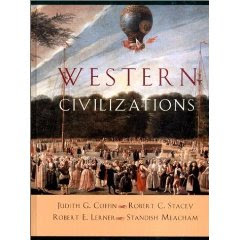 No matter what the belief system, conscious of anyone or value system that any persons or people held to over the course of the past few thousand years, the authors of this textbook talked it down. Apparently, in their quest for neutrality, they opted to just slam all belief systems equally. I would argue that speaking negatively of Christianity and Islam and Zoroastrianism in the same breath is not "neutrality." It is its own bias and an attitude of superiority. The book read as if the authors found themselves to be so intellectual that they did not need to rely on anyone other than themselves for answers to anything. Since I don't believe people are without their own worldviews and presuppositions, then I just found the text book to be silly in the way that they handled religions of any kind. I'm a Christan and I almost would have preferred for htem to say that they were of an opposing religion rather than none at all simply because it would have made them sound more thought out. As it was, they sounded like a brainiac office manager who missed an important office memo. That said, I'd still recommend this book (to learn from at random, on whim, systematically or because you, as a home schooled individual, are being forced to). (BTW, I was home schooled so I can say that!) The book is solidly laid out in a manner that repeats information so that you can clearly see how things fit together and affected various societies. In other words, the facts are repeated enough times that something ends up sticking. In short, history can be fun and this book can be too (if you want it to be)! This blog post is brought to you courtesy of the Sumarian culture who introduced a halfway decent form of writing sometime around 3,300 BC (according to this book) and by Blogger that has systematically destroyed any good writing as we used to know it. Very funny. For some reason I thought you already have a college degree? Do you mind if I ask why you are getting one now? And in HISTORY?! Thanks for reviewing this interesting book. I will have to check it out. I will also have to visit you blog more often.